This volume is the first to be devoted to the study of various properties of wide classes of degenerate elliptic operators of arbitrary order and pseudo-differential operators with multiple characteristics. Conditions for operators to be Fredholm in appropriate weighted Sobolev spaces are given, a priori estimates of solutions are derived, inequalities of the Gärding type are proved, and the principal term of the spectral asymptotics for self-adjoint operators is computed. A generalization of the classical Weyl formula is proposed. Some results are new, even for operators of the second order. In addition, an analogue of the Boutet de Monvel calculus is developed and the index is computed. 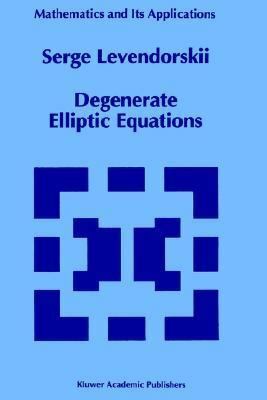 For postgraduate and research mathematicians, physicists and engineers whose work involves the solution of partial differential equations.Levendorskii, Serge is the author of 'Degenerate Elliptic Equations' with ISBN 9780792323051 and ISBN 079232305X. Loading marketplace prices 89 copies from $132.94 How does the rental process work?